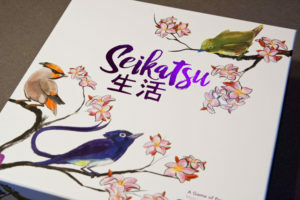 We review Seikatsu, a beautiful looking abstract strategy game published by IDW Games. In Seikatsu, players are trying to earn the most points by playing tiles into a grid, yet there are some unique endgame scorings that really take things up a notch. For an abstract strategy game to impress me, it needs to do something very unique or have some pretty stellar components. Simply putting wood blocks on a grid (while that may be functional) just isn’t going to cut it anymore, especially in this crowded market. Fortunately for Seikatsu, it tries to accomplish both of those points with its excellent production values and clever scoring mechanisms. But is it fun? Let’s find out. Seikatsu is an abstract strategy game for 1-4 players that takes about 20-30 minutes to play. Seikatsu plays best with 2-3 players. Seikatsu is a devilishly simple game. 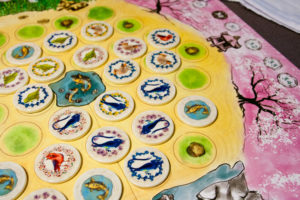 For a 2-3 player game, each player sits facing one of the colored sections of the board and draws two tiles from the bag. On a players turn, they must place one tile anywhere on the board. They will then score a point for that tile, plus any matching birds on tiles adjacent to the one they placed. They finish their turn by drawing a new tile. Then the next player takes their turn. Every tile will have one of 4 types of birds and one of 4 types of flowers. The only exception is a few koi pond tiles that act as wilds. The game ends when the last tile is placed. 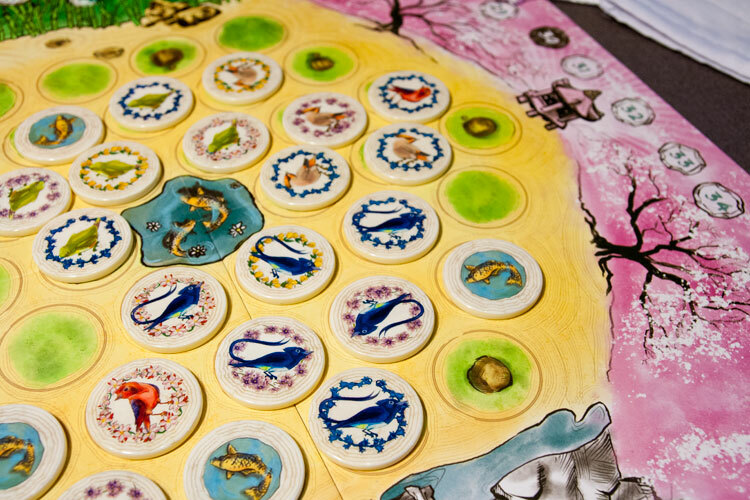 For final scoring, players look from their perspective of the board, and score rows of flowers. Flowers score based on the quantity of the most abundant type in a row. Points are awarded on a sliding scale (from 1 point to 21 points if you get 6 matching flowers). Most points wins. 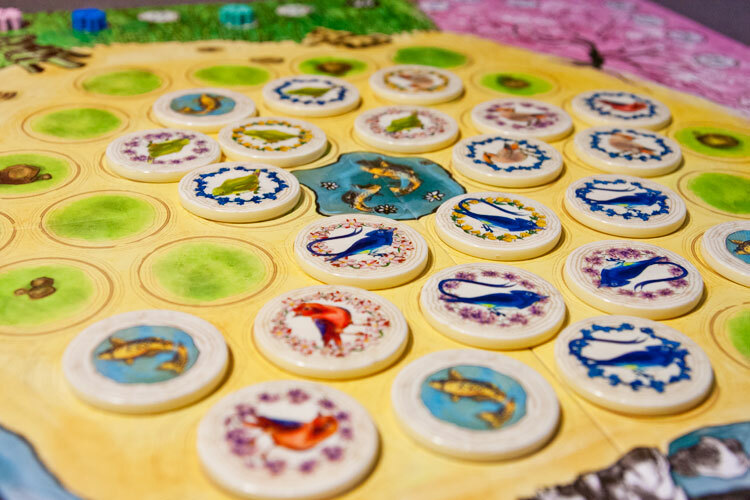 When you play a tile, you score a point for that tile and any matching adjacent birds. Seikatsu is beautiful looking game. I really enjoyed the minimalist white box, the plastic tokens that have a satisfying click/clack when stacked and the serene the artwork. The box cover even has a nice UV coating and foil printing that really makes it stand out. 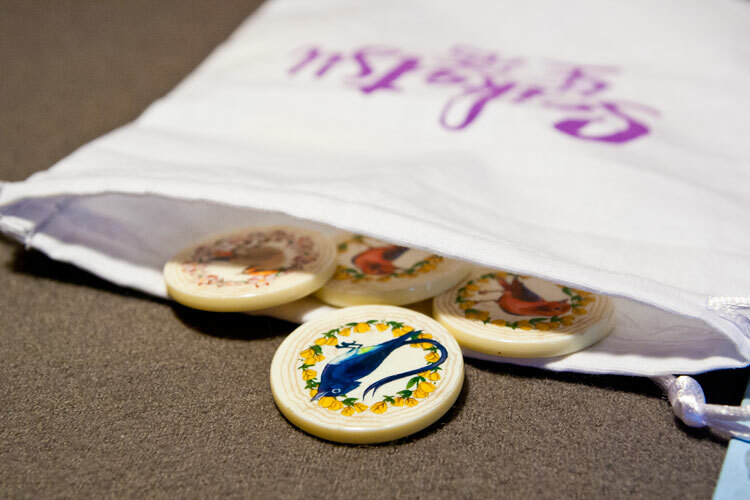 While I do wish that the tokens were clay instead of plastic, as a bit more weight would have felt great. But that’s a super minor nitpick in a game with excellent production values. Even the box cover has foil printing and UV coating. When it comes to the game play, I think Seikatsu is pretty fantastic. The rules are incredibly easy, taking no more than a minute or two to explain. Place a tile, draw a tile. It’s simple, yet the game still offers plenty of decisions to make. The primary concern in Seikatsu is all about balancing immediate scoring against future earnings. Do you place a tile here to gain some quick points, or sacrifice points now to set yourself up for a big end game bonus? Conversely, should you forgo your end game plans to block an opponent who is making a big run on matching flowers? Speaking of end game score, I do feel like that it can be a little powerful compared to the bird scoring. While you can’t ignore the birds during the game, you really need to be setting yourself up for the end game, because that’s where the bulk of your points will be made. Usually only about 1/3 of my score comes flowers during the game. But perhaps that’s intentional from the designer. At the end of the game, you score points based on rows of flowers instead of birds. And I do really like the flower scoring mechanic. You look at the grid of tiles from your perspective. Meaning a high scoring row for you might be nothing for your opponent. It also means that you have to be paying attention to the board from different angles during the game, or else your opponent might fill up an entire row with one flower type (earning those lots of points). Players will have to carefully balance earnings vs denials when placing tiles. Finally, Seikatsu does a really good job with its player scaling…from 2-3 that is. Both 2 and 3 players play perfectly, with about the same amount of playtime and challenge. However the 4 player game feels like they shoehorned that version in to add it to the box cover player count. It’s basically the 2 player game in teams and not really something I’d recommend. Stick with 2-3 and you will be golden. Draw a tile, place a tile. The game play is simple, yet still offers plenty to think about. From the excellent production values to the engaging game play, I really enjoyed Seikatsu. This wasn’t a game that was even on my radar until I saw it at Gen Con 2017, but I’m glad it dropped into my lap. Everyone I have played it with has enjoyed it. 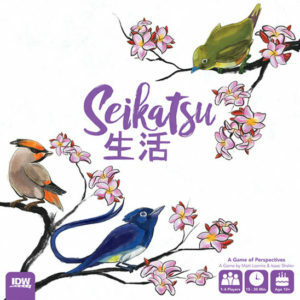 Playing Seikatsu creates an almost zen like experience as it combines some great visuals with the satisfying tactile nature of the plastic tiles. All of that fits perfectly with the gameplay as this isn’t a game where you’ll be thinking too hard or yelling at the dice. Seikatsu is one of those games that you can relax, take in the sights, and savor the casual yet engaging game play. Final Score: 4 Stars – A great, light abstract strategy game that’s both easy to learn and a joy to play.